Yes, I know it's the F-22 Raptor, but after witnessing a jaw-dropping flight demonstration by this airplane at the Rhode Island air show yesterday, "rapture" seems like the right word. I've been to many air shows and I've seen most everything that flies, but the maneuverability of the F-22 is just astounding. It's like gravity is not quite a law, more of an inconvenience for this airplane, though of course it's all done with aerodynamic forces just like any other airplane (but with a lot of computer assistance). It can fly so slow that it almost seems to stop in the air and hover, then execute a turn or a loop in very little distance. 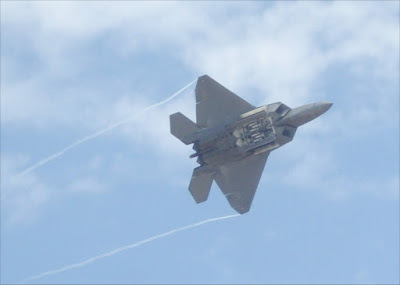 It can even "fly backwards" (sort of) - I posted a video on Flickr of the F-22 doing a tail slide maneuver, climbing straight up, stopping, and sliding down backwards for a considerable distance before flipping forward and back into regular flight. The F-22 was definitely the star of the Rhode Island National Guard Air Show 2009 that I attended with my brother yesterday at Quonset State Airport in North Kingstown (sorry, Blue Angels, though you were amazing as always). I had never seen anything like it. But the rest of the show was great too. We had blue skies the entire day (after a solid week of rain) and this made the aerial performances all the more enjoyable. There were several excellent civilian aerobatics performers including the great Sean Tucker, a nice flight demonstration by a pair of vintage P-51 Mustangs, as well as virtouso demo team performances by the Canadian Snowbirds and the US Navy Blue Angels. 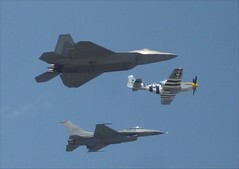 A Mustang and an F-16 also joined the F-22 for a "Heritage Flight" close formation fly-by which was very cool (shown here - more pictures on my Flickr site). I got to hang out for a while inside a V-22 Osprey (mainly for the shade and the seat), but unfortunately it didn't fly for the show, which would have been nice to see (this is the Marines' tilt-rotor transport, a hybrid airplane/helicopter). And of course there's that great air show food! All in all a fine day of kid-flashback aviation excitement. And beer. Listening to headphones is such a common experience, but sometimes it still seems really weird. Sound normally comes from somewhere in the external environment, and your two ears help you to figure out the direction and to some extent the distance of a sound source. But with headphones feeding stereo music directly into your ears, you experience a "virtual soundscape" in which sounds seem to come from various directions and distances, but which really come from two small sound sources close to (or even in) each ear. Of course you can also experience this with stereo speakers (or better yet, with surround sound speakers), but it's more natural since the "sound field" actually surrounds you. With headphones, it's really more like the sounds are somehow in your head. I really like the experience, but sometimes it does seem weird. 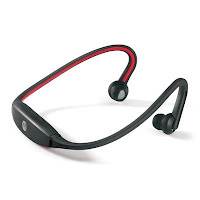 I'm hearing this very strongly right now with my iPod Touch, using a new Motorola S9 wireless (Bluetooth) headset. This was made possible by the recently released 3.0 version of the iPhone/iPod Touch software that added Bluetooth support among other cool things (especially copy/paste). The fact that there are no wires and that the ear buds fit so snugly in my ears really seems to enhance this "voices in my head" experience. No psychosis or non-native chemicals required. Since I'm working on arranging and recording vocals for a few of my new songs, I've been listening for inspiration to some of the masters of background vocals, especially the Beatles and the Beach Boys. The Beach Boys' 1972 album Carl and the Passions - So Tough is not usually considered one of their best, but for background vocals, it is simply amazing, especially if you listen through headphones. It's so much more than angelic harmonies (though there are plenty of those). There are many layers and textures, but the voices are still very distinct in the mix. With help from Roger Lavallee on arrangements and production, I've gotten some pretty good background vocal blends and effects on some of my own recordings (not that I would compare myself to the Beach Boys). One example that's on MySpace Music is my song "Just Dancing." We were definitely thinking of the Beach Boys on the chorus for that track. Remember me? With no posts since June 17, I think I'm officially A Very Bad Blogger. I spent last week in Munich for a trade show. It was very busy, although admittedly some of that busy time was evenings spent with friends and colleagues in beer gardens. Then I had to catch up on all the office work that piles up when you spend a week at a trade show and in beer gardens in Munich (even with a Blackberry). And today I had a vacation day for a recording session. A cool new song is almost done. I've been spending a lot of time practicing guitar, working on arrangements, singing, etc. It's nice to be immersed in music again after a few years of relative inactivity. So space blogging is light for me these days - but not for these folks. Check out the latest Carnival of Space at Starts With A Bang. Another great space-related feature on the Big Picture the other day: Mercury and the MESSENGER spacecraft. 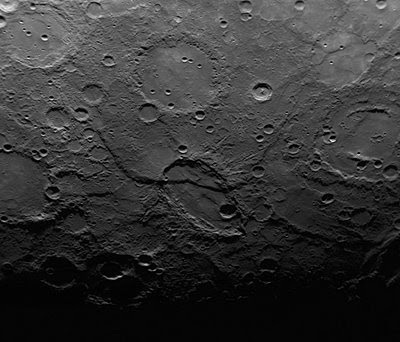 The MESSENGER view above shows the area around Sveinsdottir crater (the odd elliptical feature near the center). MESSENGER will enter Mercury orbit in March 2011 after one more flyby of the planet. The Carnival of Space is hosted this week by Innumerable Worlds. 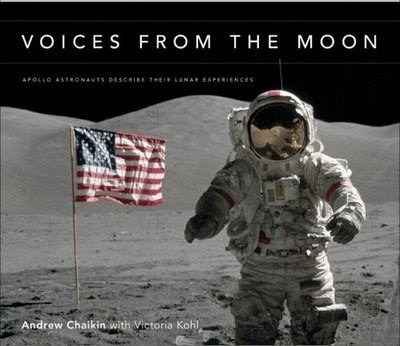 There's the usual wide range of space and astronomy topics, but I immediately checked out two posts that offered previews of a new Apollo book by Andrew Chaikin. Cumbrian Sky and CollectSpace were both authorized to show a photo from the book that has never been seen before. It's a frame from a movie camera on the LM that recorded the Apollo 11 EVA, recently digitized at high enough resolution to actually show Neil Armstrong's face (his gold visor was up for a while near the start of the EVA). Very cool! The Apollo 11 40th anniversary is coming up next month, so there are a lot of books and events planned. Chaikin's book A Man on the Moon is the classic history of Apollo, and he actually has two new books, Voices from the Moon (the source of the "new" pictures) and Mission Control, this is Apollo (with paintings by Apollo 12 LM pilot Alan Bean). Very tempting, but my books are out of control, so I need to be smart about this. Must... resist... two-day-one-click... BUTTON!!! 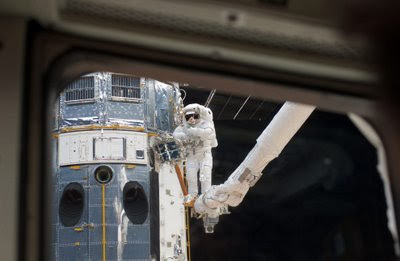 The launch of STS-127 was delayed (possibly to July) due to a hydrogen leak problem, but as I was looking through my various space blog feeds this morning, I noticed a May 18 item I had missed before, a Boston Globe "Big Picture" feature on last month's final Hubble servicing mission (STS-125). It's a great selection of (big) pictures. The one here shows Andrew Feustel on the first EVA of the mission. I don't know if it's official but it's true: I'm in one of my musical obsession phases. 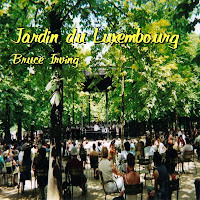 The last one was roughly 2001 to 2004, and resulted in my first album, "Jardin du Luxembourg" (shown, also on CD Baby). I'm now working on writing and recording songs for a new album, and that leads me to start thinking about performing again (starting with open mikes to try out new material, just me and my guitar). That might start in the summer at whatever spots I can find in the greater Boston area (there are quite a few as you can see from this list). In the meantime I've updated my music web site (it still needs a lot of work, which might happen sometime) and set up a MySpace Music page to preview some of the new material including the title track for the new album, "Message from Tomorrow." I even joined Facebook (everybody's doing it). I will still be writing about space and astronomy and doing educational outreach events, but I expect that music will be getting more time and attention the next few months, in my life and in this blog (I'm glad I used the ambiguous name "Music of the Spheres"). Busy week, not much time for reading or blogging. One thing I noticed that is really cool is this guest post on the Planetary Society blog. 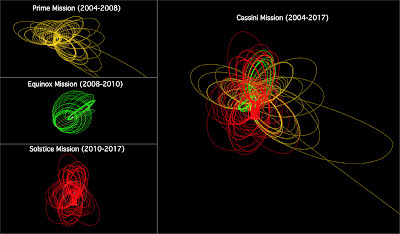 John Smith is a planetary tour designer at JPL, one of just two or three people who work on designing the orbital journeys of the Cassini spacecraft since it arrived in Saturn orbit in 2004. His article is really fascinating, and it doesn't even delve into much in the way of orbital mechanics. It's amazing how many constraints they have to meet to try to achieve the many science goals (all within the constraints of orbital mechanics, i.e., physics). Just as we optical engineers will say "it's all done with mirrors" (not really), orbital engineers will say, "it's all done with gravity," and of course it is. The "engine" that really allows Cassini to travel in the wide range of orbits needed to visit the various moons of Saturn is actually the gravity of Titan, Saturn's largest moon. Every time Cassini passes near Titan, its orbit can be slightly or dramatically changed, with full control depending on the location and closeness of the orbital path to Titan. Cassini has thrusters and a small fuel supply for attitude control and for minor adjustments to some orbits, but Titan's gravity is what does the "heavy lifting" when it comes to changing the orbit. I've simulated a few close passes to Titan in Orbiter (with the Cassini add-on or other spacecraft, it doesn't really matter), usually when something interesting has happened recently with Cassini (like finding those methane/ethane lakes) and I want to show this in a space demo. 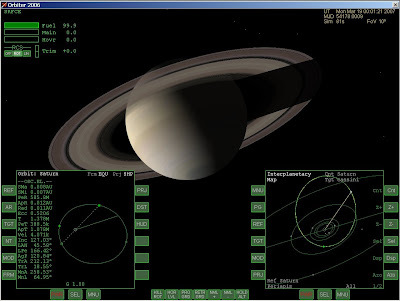 I've always gotten specific orbit data from JPL's Horizon's database so I know it will work (then I play around with the views in Orbiter so it looks really cool in the demo, especially with time acceleration), but you can also use Orbiter to experiment with gravity-assist maneuvers on your own, using the scenario editor and navigation tools like IMFD. I made a mistake when I submitted my new song "Message from Tomorrow" for reviews at Garageband.com - I accidentally put it into the "rock" category instead of pop-rock. That may seem like a small detail, but they try to match up each song with some similar songs for review purposes, and nothing in "rock" was similar to my song. So after 10 days or something I still had no reviews. Bummer. Unfortunately you can't change categories once a song is submitted, so I deleted the song (losing my review credit) and resubmitted yesterday in pop-rock. Today I got my first review (pretty good). So I started to check on the "competition" in the pop-rock charts. It's tough - some of the top songs have been there since 2005! 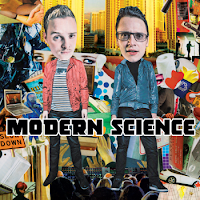 Then I listened to the track of the day, a song called "I'm the One (Pick Me)" by Modern Science, a Las Vegas band (duo actually). This song is great! So I checked out the rest of their tunes on GB, and ended up downloading their album from their web site (free right now for 128K MP3 version - heavy promo). All ten songs are good, and five of them are amazing. So now I'm a fan and I plan to buy the CD to show my support (I do that sort of thing a lot - I'm a "struggling musician" myself but I have a better than average income thanks to my "day gig"). These guys are really good ("Pick Me" is only #173 out of 309 active songs, but it looks like it arrived very recently - my song is brand new so #309 - you start at the bottom). I'm impressed and a little intimidated (there are many great songs on the pop-rock chart). Glad I'm only in the music game for fun these days! The new Carnival of Space has arrived, hosted by Next Big Future. Of special interest is a photographic preview of a full-scale mock-up of the Altair lunar lander under construction at JSC, courtesy of Louise Riofrio of A Babe in the Universe. The current design will be four stories tall! "Human Japanese" is sort of a funny name (as opposed to "dog Japanese? 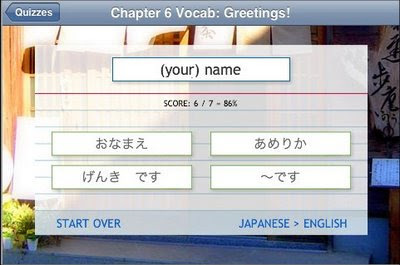 "), but it's a great piece of software if you are interested in learning or reviewing the basics of Japanese. Back in the early 90's when I was actively learning Japanese and also playing around with HyperCard on the Mac, I tried to develop some interactive Japanese lessons for vocabulary and for learning to read and write hiragana and katakana. I didn't get very far - it's a lot of work for one person and there wasn't much system support for this sort of thing in HyperCard. But "Human Japanese" (version 2.0) is just the sort of thing I had in mind - self-paced, interactive, friendly, and easy to use, and best of all, it now runs on the iPod Touch (and iPhone) with its amazing touch-screen interface and audio capabilities (used for ~1800 native Japanese speech samples). The program covers basic grammar and vocabulary as well as reading and writing the two phonetic syllabaries, hiragana and katakana. I played with the free "lite" version for about 10 minutes before deciding to spend $10 on the full version, which is an amazing price for any introductory Japanese text book, let alone an interactive one with embedded audio and animations. Learning Japanese is an interesting and complex task, and I still have a lot of interest in Japanese learning methods and materials, as well as an affection for the language. I would like to retain some level of skill even though I rarely go to Japan these days (my most frequent Japanese task is checking business card translation proofs for colleagues at work who are traveling to Japan). Based on the quizes I have tried in several chapters, I still know this basic material pretty well, but anything that gives me a reason to play with Japanese is cool, and I really like this app a lot. It's 30 MB with 40 chapters, with many exercises and quizzes, audio for all Japanese text, and a lot of explanatory English text that is actually fun to read. It quickly transitions you to reading and writing Japanese in the Japanese phonetic system rather than in "Roman letters" which is a really useful thing (for further study as well as for reading many signs and menus in Japan). If you have an interest in Japanese study at any level, I think you would like this learning software. You could learn basic vocabulary and grammar as well how to read and write kana very quickly and easily, and it would also be good for reviewing the basics if you're a bit rusty. It's available now for Windows XP or Vista in addition to the iPhone/iPod Touch version. A browser-based version is planned for Mac/Linux users. I don't remember how I came across this, but IEEE Spectrum (electrical engineering professional society journal) has a special feature this week called "Why Mars? Why Now?" with some 33 articles, features, and opinion pieces by a range of authors. With sections labeled Challenges, Business, Voyage, Strategy, Exploration, and Space Ambitions, this special feature covers a lot of ground. Articles include "Why a Manned Mission to Mars Seems as Far Away as Ever" (countered by an article "How to Go to Mars - Right Now!" by - you guessed it - Robert Zubrin - go Bob! ), "Space is Risky Business" by Elon Musk (he should know), and "10 Favorite Mars Novels" by Kim Stanley Robinson (he should know). And many more, including an interview with Owen and Richard Garriott, father and son space travelers. Great stuff, though I don't know how long the top level page will stay around since I've never looked at any IEEE special reports before (it's a generic "special-reports" URL), which is why I included some of the direct article links above. This may be a more permanent link, though it's hard to tell since I've had a lot of trouble accessing these articles for some reason (slow and/or very busy server?). The upshot is that getting humans to Mars is a complex, multifaceted, interesting, and difficult problem, though opinions vary on just how difficult, with Robert Zubrin's "we have the technology - let's do it now" being the most optimistic (he's the president of the Mars Society, of which I am a card-carrying member). There's also an opinion piece called "The Mars Challenge," by Dr. Leah H. Jamieson, an EE professor at Purdue University. She discusses how first year Purdue engineering students believe that sending people to Mars might be their generation's greatest technological legacy. Space can still inspire, and the long-run benefits of the original Space Race and of the Apollo program seem indisputable to me, more so in the people and the ventures it inspired than in the specific technologies, though there were many impressive and important "spin-offs. "Like many other engineers and scientists of my generation, I was directly inspired by the space program of the 1960's to pursue a technical education and career, though I ended up an optical engineer rather than an aeronautical engineer and astronaut as I had planned in the sixth grade. 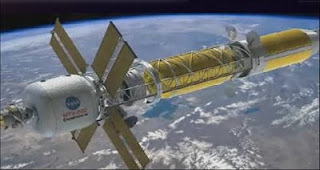 Could "energy" be the current or next generation's "Apollo program?" It's important enough, but I'm not so sure. I really think there is something magic about working to get people to another world. I know the Cold War was a big part of the Apollo program, and for Mars I would personally prefer that we do it cooperatively with other nations, not in competition. Maybe that's naive and a deal-breaker, I don't know. But I truly believe that a serious effort to get people to Mars sooner rather than later will reap great benefits in inspiration as well as in technology, jobs, and spin-offs. And who knows, maybe even peace. Yup, naive. As I mentioned a few weeks back, I did a second podcast for 365daysofastronomy.org, and it's available today. It's called "JPL's Greatest Hits" and in it, I talk about what I consider to be the "top 10" space exploration missions that have come out of the amazing Jet Propulsion Laboratory since 1958. It's a pretty subjective list, of course, since JPL has done so many great missions and continues to do so today. But it's fun and I hope also informative. I had planned to do a few supplementary posts for this podcast, but I got distracted by other things the last few weeks, and I forgot! I will probably add a few posts on specific JPL missions in the next few days, and I have also started a new set on my Flickr site to post some images. Of course you can get plenty of information and images from JPL's own web site, including this summary page listing all JPL missions. 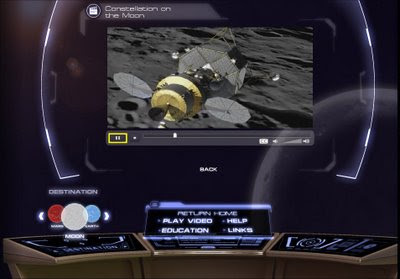 But what you can't get from JPL is a way to "fly" those missions yourself using the free Orbiter space flight simulator, which is something I mention only briefly in the podcast itself. Add-on makers have created amazing simulations of many of JPL's spacecraft, including 9 of my top 10. Some of these include extensive documentation and will allow you to simulate the missions from launch to orbital insertion or landing. Many include deployable or operable parts, so you can really learn a lot about these missions by playing with these simulations. I have tried nearly all of these add-ons in Orbiter at one time or another, but not all of them recently, so I can't guarantee that some of the older ones will work right out of the box with the current version of Orbiter. Check with the Orbiter Forum if you have trouble, or post a comment here. I won't use the DJ-like backwards countdown for this list. All of these free Orbiter add-ons and many, many more are available at Orbit Hangar. John Graves is clearly a champion of planetary exploration simulations for Orbiter! Mars Rovers, add-on by Scott Conklin ("Usonian") - Amazingly complete and detailed! See picture above. 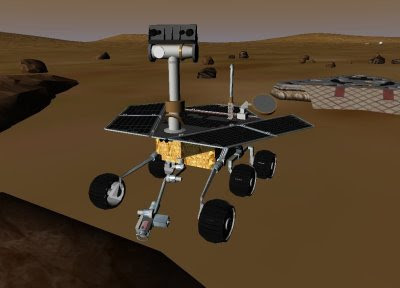 Mars Global Surveyor is not available, but Brian Jones' MRO add-on is great! Note also that you can enhance the experience of some of these missions by installing optional high-resolution textures for moons and planets, such as the Saturn moon textures by "Fordprefect," Jupiter moon textures by "McWogs," and the Mercury surface texture by Jim Williams. More to come in the next few days - please check back, and also let me know if you have any questions or special topics you would like me to discuss. I got an educational material notification email from NASA today about new interactive activities and videos on the Constellation program. Hosted by astronaut Pam Melroy, the video clips focus on three mission areas for Constellation: Earth orbit, the Moon, and (eventually) Mars. The animations are cool and feature versions of some spacecraft that were new to me, especially the Altair lunar lander and a Mars-bound spacecraft stack with an inflatable "trans-hab" component (NASA licensed that technology to Bigelow, so I guess they figure they'll buy it from him COTS). The focus is also educational, and for the Mars stuff, they note that while the date for a Mars landing is uncertain ("next few decades"), the first astronauts on Mars are probably kids today, kids who should be staying in school and studying math and science so they can their shot at the Red Planet. Carnival of Space #105 has arrived at Space Disco, which is now hosted by Ian O'Neill (Dave Mosher having moved on to a new job). It's quite a colorful carnival this week, and Ian's descriptions of the posts are great. Check it out.